We offer a 700 sq. foot dedicated Studio space for bonsai workshops, study sessions and teaching events. The Studio is conveniently located off I-75 in central Kentucky. Berea is on the I-75 corridor -2 hours from Cincinnati, Louisville or Knoxville. 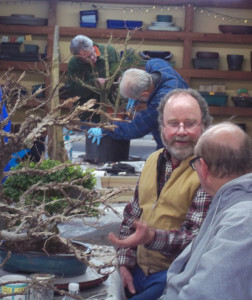 In 2015 the Studio is hosting an advanced bonsai study group with visiting master Rodney Clemons of Atlanta, Georgia. This Study group is meeting four times throughout the growing season to assist participants in further developing skills and trees. We currently have two summer workshops sessions scheduled in July. See our workshop and events pages for details. An additional workshop is scheduled at the Baker Hunt Arts and Cultural Center in Covington, KY. 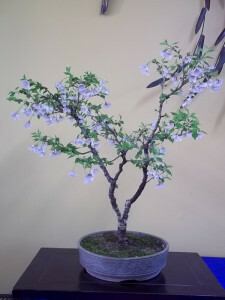 If you have a questions about an existing bonsai, need some guidance on styling, maintenance or care of a tree or are interested in beginning a new tree project, schedule a visit to the Studio. We are typically open on the third Sunday of each month April through September. We will be present 1:00 to 5:00 pm to work with you and discuss your trees. Bring your own material or initiate a new bonsai project from over 1000 bonsai, pre-bonsai and raw stock trees in our nursery facility. We sometimes travel so please contact us to establish an appointment time and for directions if you have not been to the Studio before. Check back for additional events and promotions offered at the Studio.